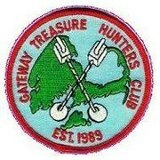 Come visit for great raffles, three large hunt areas with thousands of coins and great treasure for tokens. Enjoy the fun and great New England seafood at the local eateries. Oh what I wouldn’t give to hunt some Colonial era soil! Alas! unfortunately that trip will have to wait. Thank you for the invitation all the same!